These four pictures, below are of our Henry. He is a Lhasa Apsos, and is 7 years old. Born in Okla. City. His hobbies are: Watching TV, playing ball, and going for walks. Neslie is a Dachshund. She is 11 years old. 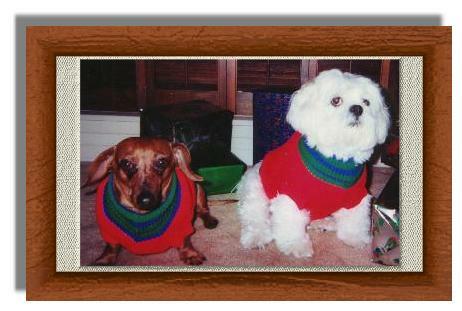 She takes great pride that she was an entrant in the Weiner Dog Nationals race in Dallas in 1998. Her hobbies are: Snoozing and snacking. These two pictures below are of Samantha "Sammy" Green. She is 16 years old. A terrific little cat. Doesn't have any bad habits. Likes to sleep and eat lunch. These are Stacy's two little cats. Top: Murphy, Bottom: Murpy and Molly. They live in Dallas. Murphy is 5 years old. Molly is 7 months.